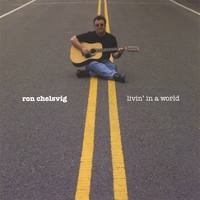 Living in two seemingly disparate worlds, Philly local musician Ron Chelsvig is both a physical therapist and singer songwriter. Each provide benefit to the people he serves. His musical gifts are evident in the 2005 release Livin’ In A World. The Universe had a sense of humor, since the man who originally hails from Story City, Iowa indeed tells stories with his music. They are about love, loss and loneliness, hope and redemption and take the listener on a journey through various genres and stylings. Would You Look My Way has a harder rocking Who infusion, embellished by the electric violin of another talented regional performer, Caryn Lin. In it, Chelsvig dares to bare his soul. Dreaming carries a lazy drifty Caribbean feel, so much so that it is easy to imagine lying in a seaside hammock as you listen effortlessly. Rocket Man has the most complicated story line and I wondered if this was about someone who had his own ‘dark side of the moon’ experience. Written by Tom Rapp, it offers the sad lyrics “My father was a rocket man. He loved the world beyond the world. The sky beyond the sky. And on my mother’s face. As lonely as the world in space. I could read the silent cry.” The wailing of Chelsvig’s trumpet echo those tears. Two Lonely People feels like an ideal follow-up as it has the characters offering their hearts, their love and their bodies to each other, if only for one night. This Time invites throwing caution to the wind with the lyrics “This time. This time. Run away with me.” as Chelsvig’s voice mellows and caresses the listener’s ear. A reggae reprise of Livin’ In A World closes this potpourri of peace and presence.